When you’ve realized your brand identity is out-of-date, out-of-touch with what your audiences expect, you might consider a brand new look. 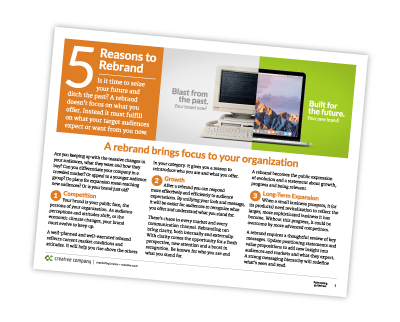 Yet a complete rebrand can be a major undertaking. There is another option. If your current brand identity design has good recognition, a brand refresh builds on that recognition. It keeps a visual connection with your current identity. You can make your brand new again by simplifying, streamlining and establishing new design standards. A brand refresh is simpler than a total rebrand. Because design exploration is built on using parts of the current visual identity, it takes less time–both for creative development and for review. It’s a quicker, lower-cost way to achieve a brand new look. But even with a brand refresh, don’t give up the deep dive into who you are, what you stand for and what your audiences appreciate. Ensure your positioning and messaging lines up with the brand new you, too. The Orlando Construction logo, created in the ’80s, needed an update. Simplifying and streamlining while keeping the orange and the script font created a strong brand refresh and a new brand promise. Companies in business for more than twenty years often have a logo created before digital marketing and the internet took over. Although the design worked fine in print, it may not work well on the web. Or the design has evolved over time with different people applying it in multiple ways. Now there are many versions of the logo with different fonts and configurations, as was the case for First Federal, shown below. The new brand identity cleans up what may have been a complex design or one that has morphed over time. It establishes new standards for colors, fonts, proportions and vertical or horizontal applications. It can update a mark, or solidify specific font treatments that “lock-up” with the mark to keep up consistency online and off. The green and the wheat symbol were updated and used to refresh First Federal. A new font and “lockups” were developed to create consistency in all applications. For First Federal, a brand refresh created the consistency a new brand would deliver. Leadership knew there was recognition for the wheat image, but font treatments were random and inconsistent. It was time to clean up their look and create a brand new system that built on what was already recognized. We designed specific proportions and lock-ups, with two chosen fonts, to elevate their brand identity. The new polished and professional look works well both online and in print. Their brand new look retained elements of the old. They moved forward with a new brand their existing customers still recognized. While updating the brand identity, we also examined their positioning. Their strong local presence was emphasized by the brand promise, “we’re here.” Their history in Yamhill County and in the communities they served differentiated them from the competition–large, corporate, out-of-state banks. Often as a company evolves, the logo design morphs. Staff chooses colors they think are correct, or may stretch or crop an existing logo to fit a new application. New staff put their own spin on the old logo and may apply it in not so “creative” ways. The result is elements that, when compared side by side, don’t match. Communication tools are not consistent. Brand integrity is damaged. And often no one knows which file is the correct one to use. The Gormley Plumbing logo was difficult to work with in different applications. 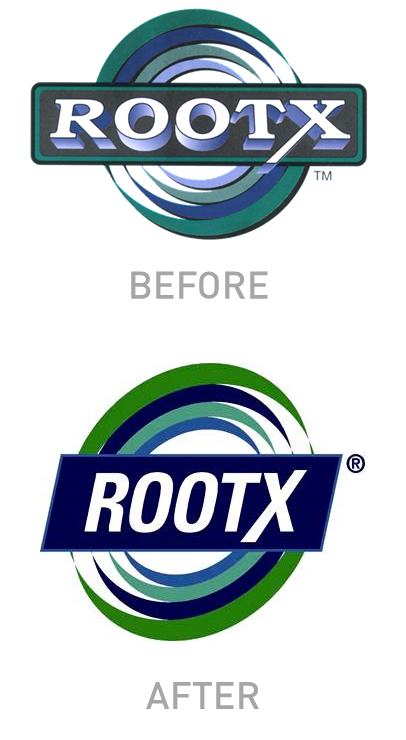 A brand refresh cleaned it up while retaining recognition of who the company is and what they offer. When you rethink and clean up logo elements, establish standards and guidelines, new fonts and colors, a new brand is defined. You’ll have a brand new way to look at what was old and difficult to work with. 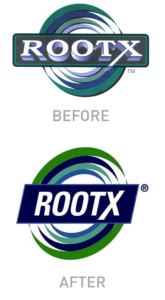 The old version of RootX was difficult to reproduce. We cleaned it up and retained the swirl while making it cleaner and bolder. In our logo design process, we create lockups for vertical and horizontal, with and without the mark, and with and without a designed brand promise (tagline). We also create a complete set of digital files for color, black and white, grayscale and reverse in CMYK, RGB, HTML and PMS colors. The client then has a comprehensive resource in an online folder which maintains brand standards no matter who is working with the new logo design. Thus staff doesn’t have to search files and folders, or ask other staff members to find a logo to use on the website, or for signing or forms or emails or giveaways. The right file formats in standard colors are all available in one place. We live in a visual culture, people have less patience, everything is “at a glance.” When your brand identity blends in with the competition, or looks out of date and out of touch with what’s current, you run the risk of being ignored and losing potential business. Change happens more quickly now than it did a decade or two ago. If your brand identity has languished for more than ten years, it may be time to refresh for the new year. Refresh for new recognition. Refresh to demand attention from the audiences you must reach to be successful. All excellent goals for any effective brand identity system. And a brand refresh is a way to have a brand new you for the coming year. You may be interested in these other posts about branding and rebranding. Are you ready to embrace the change of a new name and new brand? Any good rebrand program begins with a review of your target audiences. Who are they? What do they expect? Where do you reach them? Use our worksheet below to begin your analysis.